The Bills are a team that has a kickoff specialist in Jordan Gay, who is beginning his second season with the team. They believe there is value in having one so long as he’s very effective. Head coach Rex Ryan was asked about it and he’s on board with carrying one so long as he proves himself in the regular season. Gay finished ninth in the league in touchback percentage. His numbers would’ve been higher had there not been some game plans where he was specifically asked to hang kicks up in the air and short of the goal line. Indianapolis has a kickoff specialist. He just also happens to be the team’s punter in Pat McAfee. More and more NFL clubs are making sure they have a kicker who can put the ball through the back of the end zone on kickoffs, be it their place kicker or a kickoff specialist. Last season Buffalo carried Dan Carpenter for field goals and Jordan Gay for kickoffs. In the eyes of special teams coordinator Danny Crossman, Gay’s statistics from the 2014 season make him worthy of a roster spot. So where does head coach Rex Ryan come down on carrying a kickoff specialist? Ryan gave indication that he’s leaning in the same direction as Crossman, provided the consistency of the kickoff specialist is there. Seventh-grader Trey Dawson takes a photo of him and Jordan Gay Tuesday at Bate Middle School. 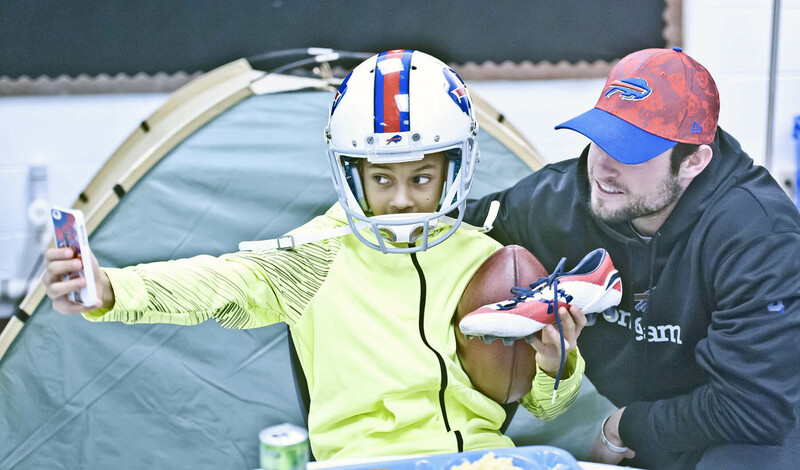 On Buffalobills.com we profiled how Bills kickoff specialist Jordan Gay helped some special ed math students learn how to graph as they used his kickoff statistics from the 2014 season. The students, who attend the same middle school that Gay went through in his hometown of Danville, Kentucky, also got a chance to meet Gay at the end of the season when he came in for a visit. Gay thought he was just meeting the one class, but it turned out to be much more than that. Gay was received like a rock star at Bate middle school back in January. 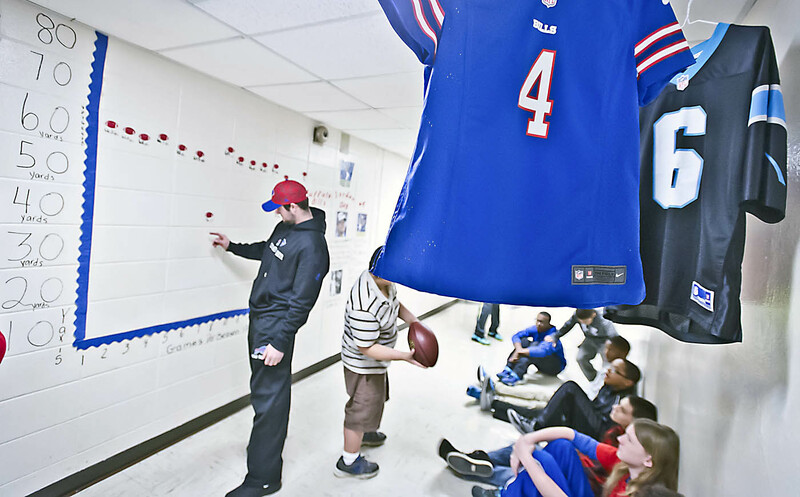 The special ed teacher Robin Moler, made a giant graph of Gay’s kickoff stats from ceiling to floor in the hallway outside her classroom near the gymnasium. Gay talked to the students out in the hall about his week to week performance. Moler, the middle school teacher who came up with the idea to use Gay’s kickoff stats already has plans for next year. With the preseason coming to a close head coach Doug Marrone is still trying to nail down a kickoff specialist for his squad. They claimed P/K Jordan Gay off waivers this week and he had a kickoff to start the second half. It went to the goal line and he had a punt. Marrone sees a big advantage in having a kickoff specialist.